Spring coming borne upon the tulip scent. Feel warm spring with tulips. Spring coming borne upon the tulip scent / Feel warm spring with tulips. If spring approaches, tulips are competitively bursting into bloom lovably, and make our minds move into the middle of spring before we know. 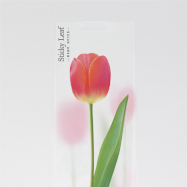 The sticky leaf tulip that will melt cold winter presents comfortably warm spring to everyone around me.